Finnish company EkoRent is investing in an electric taxi service accessible via an application available in Nairobi, Kenya's capital. Objective: reduce car pollution as it already does in Helsinki, the capital of Finland. Nairobi, the capital of Kenya, has a population of more than 4 million. The high population growth reflects the monster traffic jams and the roar of vehicles during peak hours. We used to hear about pollution in Beijing, the Chinese capital, but now, the large East African city Nairobi, is not spared by the phenomenon of developing countries. In many cities such as Paris in France and Helsinki in Finland, individual transport service solutions are already being used via an application. In the Kenyan capital, this novelty is revolutionising public transport, following the example of Uber in several Western countries. However, in the case of Kenya, the vehicles used are electric. The project is the work of EkoRent, a Finnish company, which has also invested in Helsinki. In Nairobi, it decided to name its service Nopia Ride. “It is important to move away from a transportation model that depends on fossil fuels and personal cars,” says Ariadne Baskin of UN-Environment, which supports the project. And to continue, “Nopia Ride contributes to this by combining public transport and electric mobility. On a larger scale, this reduces the number of vehicles on the road, relieves congestion and reduces energy consumption and CO2 emissions. For his part, EkoRent justified the choice of Kenya’s capital as a drop-off point on the African continent by the fact that “the city is full of great opportunities to do business while protecting the environment”. In addition, Nopia Ride has lowered prices for users compared to ordinary yellow taxis. At the same time, Nopia Ride drivers would not have to pay for a full tank as the cars are provided with recharging, which would allow them to earn a better living than with competing services. On site in Nairobi, the company has been carrying out major works since August 2018. It is currently building several charging stations to facilitate the operation of its blue cars. Its objective is to have up to 15,000 electric cars in the city by 2021. “If this model works here, then we can replicate it outside Nairobi. We will not stop there. We want to go everywhere in Africa,” says Juha Suojanen, CEO and founder of EkoRent. An ambition, which for the moment is far from being unanimously accepted. 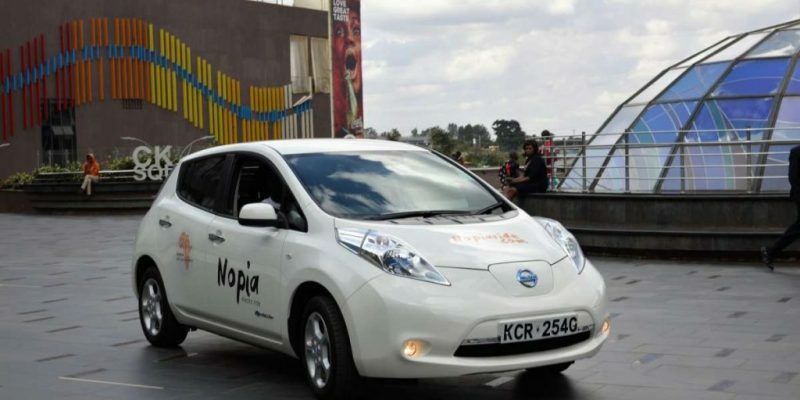 Nopia Ride offers low-cost travel, which is in serious competition with Nairobi taxis.